If you’re heading to Tennessee with your special someone, interested in spending some quality time together over a romantic weekend or weeklong getaway, then A View for Two is an ideal option for you. You’ll get incredible Smoky Mountain views from every angle, and the one-bedroom configuration means that you get a cozy cabin in which to relax and enjoy each other’s company. The cabin also comes with all the modern amenities, including Wi-Fi, a massive private deck, an outdoor hot tub, two high-definition TVs, and more. If you’ll be coming to the mountains with the entire family and aren’t willing to compromise when it comes to Smoky Mountain views, then All About That View might be the best choice. 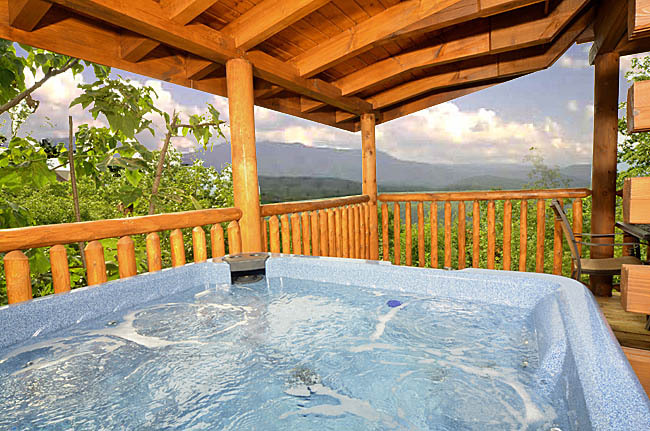 It features three bedrooms and two baths, and some of the most expansive views of any of our cabins in the Smokies. The name really does say it all. You’ll also find a four-person hot tub, a shuffleboard table, an electric fireplace, five TVs, and even a PS3 with games included. For a smaller family or group of friends, Amazing Smoky Views lives up to its name, as well. It perches directly on the side of the mountain, offering stunning Smoky Mountain views out over the valley and forest below. It also comes with a host of modern amenities, including an Xbox 360, Wi-Fi, multiple 3D TVs, and even a washer and dryer. Not that this cabin offers two bedrooms and two and a half baths, as well as three covered decks so you never need to worry that your view might be crowded. Ready to make the most of those Smoky Mountain views? Our cabins in the Smokies range from those ideal for a couple’s getaway to family reunions. Whether you want a quiet weekend away together or enough space to accommodate a crowd, you’ll find exactly what you want within our inventory and they all come with amazing views of the mountains and forests. Most of our cabins are also located in very close proximity to Gatlinburg and Pigeon Forge – imagine enjoying your mountain view in the morning, and then driving just a few minutes to spend the afternoon shopping and dining, or enjoying the theme parks or arts and crafts community! Visit us at Timberwinds Log Cabin Rentals today!